Count Arrivabene. Sitter in 1 portrait. Mr Burnett. Sitter in 1 portrait. Lady Edith Campbell. Sitter in 1 portrait. Miss Campbell (active 1868). Sitter in 1 portrait. E. Cooper. Sitter in 1 portrait. Sir John Fowler, 1st Bt (1817-1898), Civil engineer. Sitter associated with 7 portraits. Mr Gilpin. Sitter in 1 portrait. Captain Helbert. Sitter in 1 portrait. T.M. Johnson. Sitter in 1 portrait. Francis George Lawley. Sitter in 1 portrait. Mr Morton (active 1868). Sitter in 1 portrait. James Hall Nasmyth (1808-1890), Mechanical engineer; son of Alexander Nasmyth. Sitter in 6 portraits. Prince Polignac. Sitter in 1 portrait. Arthur Philip Stanhope, 6th Earl Stanhope (1838-1905), Conservative politician; MP for Leominster and Suffolk. Sitter in 9 portraits. Lord Ronald Charles Sutherland-Leveson-Gower (1845-1916), Dilettante, sculptor and writer. Sitter in 10 portraits, Artist associated with 4 portraits. Lady De Vesci. Sitter in 1 portrait. Miss Vesy. Sitter in 1 portrait. Mr Walker (active early 1860s), Swimmer. Sitter in 2 portraits. In October 1868 the Metropolitan Railway opened a line extension from Paddington to Gloucester Road via Kensington High Street. 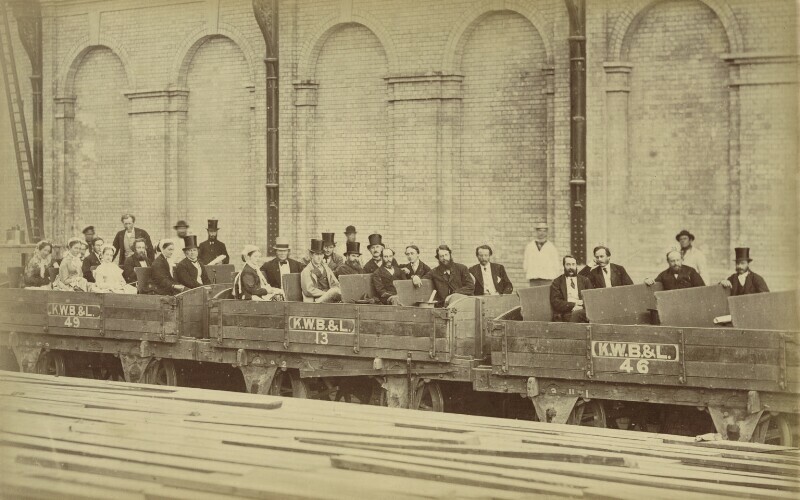 This photograph shows the Gladstones and other eminent figures on a trial ride the previous July. Other members of the party include the MP Arthur Philip Stanhope, sculptor and poet Thomas Woolner and esteemed railway engineer Sir John Fowler. William Ewart and Catherine Gladstone are seated at the front and back of the last wagon respectively. Journalists were invited to record such events in the hope that the coverage would allay public concerns about the safety of the network. Following the Earl of Derby's resignation, Benjamin Disraeli becomes Prime Minister. However, following a near immediate Liberal election victory, he is replaced as Prime Minister by Gladstone. Gladstone sets out his mission to 'pacify Ireland'. Separately, the first meeting of the Trades Union Congress (TUC) is held in Manchester. Public executions are abolished, and are moved from outside Newgate gaol to inside the prison. Wilkie Collins's The Moonstone published. Credited with writing the first sensation novel The Woman in White, Collins's claims another first here, as the mystery surrounding the disappearance of the Herncastle diamond, is recognised as one of the first detective novels. An uprising against Spanish rule in Cuba sparks off the Ten Years' War, in which 200,000 lives are lost. Cubans in the eastern provinces unite under wealthy planter Carlos Manuel de Cespedes. Another armed uprising takes place against Spanish rule in the town of Lares in Puerto Rico, known as the 'Grito de Lares'.